I love baking and cooking - but when I'm having a busy week or I'm in a hurry, I become a seriously lazy cook. 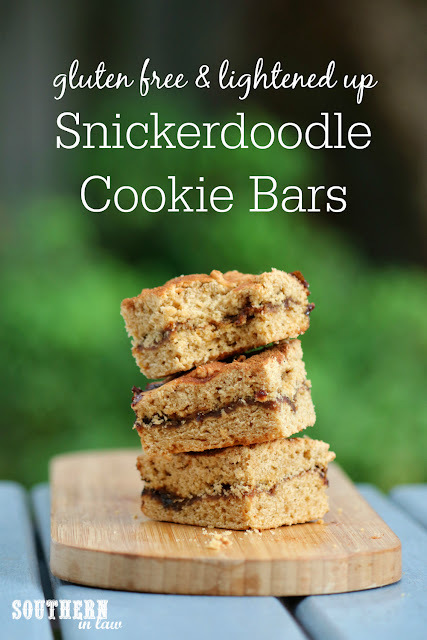 Luckily, my laziness also produces delicious recipes - because this Snickerdoodle Blondie/Cookie Bar hybrid was the result of me needing to make a dessert for something, but not wanting to make anything that involved too much effort. I know, that sounds horrible - but unfortunately, I'm not superwoman and laziness happens. But, really... the most unfortunate thing is that laziness doesn't always look this delicious. 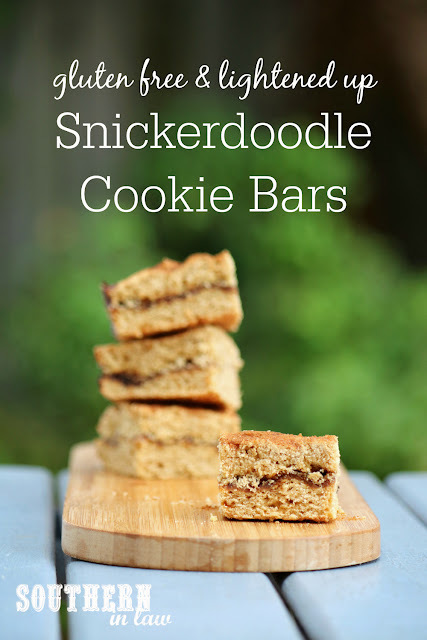 These Snickerdoodle Cookie Bars have become a family favourite - and they're the ultimate no fuss recipe. All you've got to do is make the "cookie dough", divide it in half, sprinkle on that cinnamon sugar layer, cover it up with a blanket of cookie dough and you're ready to bake! Line an 8" square baking tin with baking paper and set aside. In a mixer, cream your butter and sugar until light and fluffy, scraping down the sides in-between to ensure everything is incorporated. Add your applesauce and eggs and mix until combined. Add in your flour, baking powder and sugar and mix until combined. 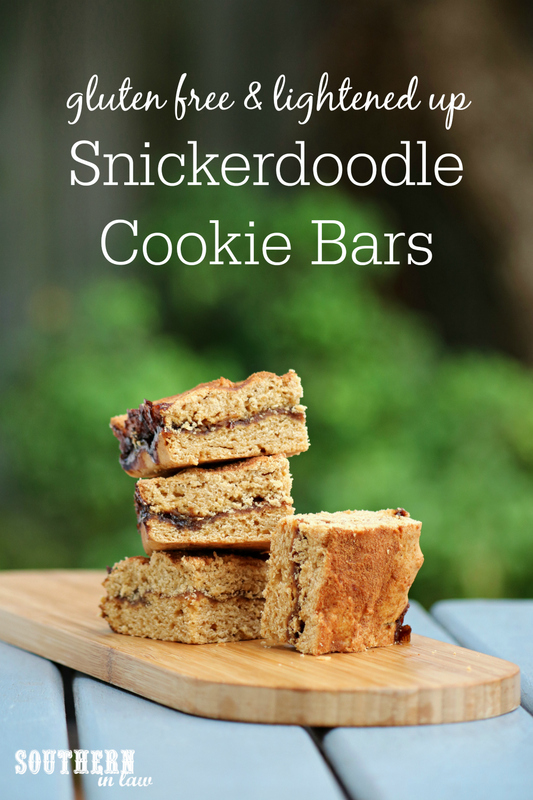 Divide your cookie dough mix in half and spread the mix to form an even layer at the bottom of your prepared pan. I find using a wet spatula or wet fingertips makes this easier and less sticky! Mix your cinnamon sugar mixture and sprinkle over the first layer of your cookie dough mix, leaving about a tablespoon of mix to sprinkle on top. Cover your cinnamon sugar layer with your remaining cookie dough. Again, use a wet spatula or wet fingertips to make this easier! Sprinkle your remaining cinnamon sugar on top. Bake for 20-25 minutes or until cooked through and firm to the touch. Allow to cool before slicing into squares and serving. 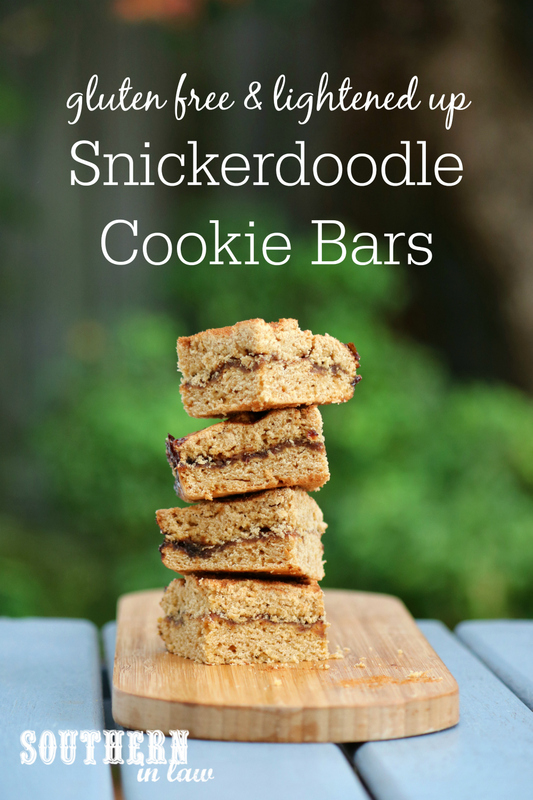 These cookie bars will keep for 3 or so days in an airtight container at room temperature, however, are best on the day they were made. But tell me, what's your go to dessert when you need something in a hurry and don't feel like baking? No shame if it's store bought - if I could find good gluten free stuff, I'd probably do that too!